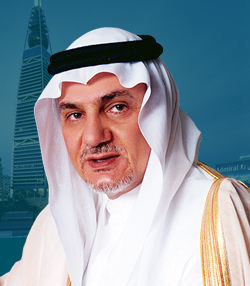 His Royal Highness Prince Turki Al Faisal bin Abdul Aziz Al Saud was born on February 15, 1945, in Makkah, Saudi Arabia. HRH began his schooling at the Model School in Taif and went on to gain his high school diploma at the Lawrenceville School in New Jersey. HRH then completed his studies at Georgetown University. His Royal Highness was appointed as an Advisor at the Royal Court in 1973. In 1977 HRH was appointed Director General (with a rank of Minister) of the General Intelligence Directorate (GID), Saudi Arabia's main foreign intelligence service and served as the head of the GID until August 2001. In October 2002 His Royal Highness was appointed as the Saudi Arabian Ambassador to the United Kingdom and the Republic of Ireland. HRH served in that position until July 2005, when he was appointed as Ambassador to the United States. He retired in February 2007. A Founder and Trustee of the King Faisal Foundation, His Royal Highness is also the Chairman of the King Faisal Center for Research and Islamic Studies. Additionally, His Royal Highness is a Trustee of the Oxford Islamic Center at Oxford University and the Center for Contemporary Arab Studies (CCAS) at Georgetown University. HRH received an honorary PhD in Law in 2010 from the University of Ulster in Ireland, an honorary PhD in International Politics in 2011 from the University of Hankuk in Korea and an honorary PhD in 2015 from the University of Shanghai. HRH is a visiting Distinguished Professor at Georgetown University. His Royal Highness is an active participant in the World Economic Forum’s Annual Meeting, the Global Economic Symposium, and the Clinton Global Initiative’s Annual Meeting. HRH is also a member of the Board of Trustees of the Library of Alexandria, a member of the Board of the Beirut Institute, member of the Board of Trustees of the Council for Arab & International Relations, member of the Board of Directors of Al-Quds Fund & Endowment and a member of the Advisory Council of the Munich Security Conference. In September 2015, the University of Rome ‘Tor Vergata’ appointed HRH as an honorary professor and the Fondazione Mediterraneo in Naples, Italy granted Mediterranean Award for Diplomacy 2015 to HRH.